Taking a taxi is the most convenient way to reach the various destinations such as beaches and scenic spots. 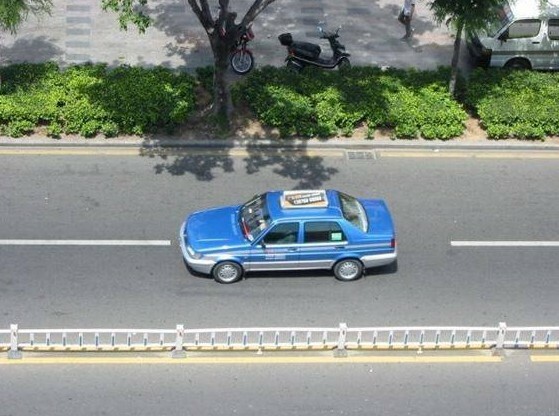 In Sanya, blue is the identical color among the 6 different taxis operators, also they all have the same flag-down price. Volkswagen Jetta, Santana, and Citroën Elysée are the main brands of taxis in Sanya. The taxi meter starts with RMB5 for the first 2 kilometers included, then adding RMB2 for an extra kilometer. Generally RMB 5-7 is fairly enough to travel in downtown Sanya. However, during the national holidays including first week of Jan., May, Oct and Chinese Spring Festival, it will be an extra fare of RMB5 for first 2km, which means the basal price will be RMB10 in stead of RMB5. For travelers In Sanya, please notice if your destinations are scenic spots, you should haggle the price with the taxi driver first, make sure you don’t get overcharged, the following of the most travel routes and taxi fares are the reference for you; please note taxi fare might vary slightly. From downtown Sanya to Yalong Bay: RMB 40-60. From Sanya Phoenix International Airport to downtown Sanya: RMB 40 to 60. From Sanya Phoenix International Airport to Dadonghai Bay: RMB 60 to 80. From Sanya Phoenix International Airport to Yalong Bay: RMB 80 to 100. Just stretch your hand downward when you see a red lamp on the front passenger side which means the taxi is available. Taxis, of course, vary from city to city, but in most cases, they are clean and the seats are covered in white cloth, usually hiding the seatbelts in the back. Many Chinese hop in front with the driver – it is not unusual. The driver will expect all persons to enter from the passenger (right) side; therefore the driver’s side back door may be locked. The driver won’t expect you to speak fluently but a friendly ni hao (pronounced "knee how" in English) meaning "hello" is always nice. Don’t be surprised if the driver looks at your destination written down and hands it back to you with silence or merely a nod. Do I tip the driver? Happily, no! Tipping is generally not something you need to worry about in China, and of course in Sanya. Taxi drivers certainly don’t expect it and wouldn’t know what you were intending. They’d probably get out of the car to hand you back your change. After you pay the fare, wait for the receipt to print and take it with you. This has the taxi’s number so if you have any complaints, or happen to forget something in the car, you can call the central number to report it. You can call for taxis complaints: 0898-88276703. This can be convenient for forgotten purchases in the trunk. WOS have searched around Sanya to get you some of the GREAT places in Sanya and we bring these places to you in the most convenient way by showing you how to get there by using a Taxi. The taxi cards have all the details which also contain Chinese addresses. Just browser through the data, follow the prompts, print a listing and bring them with you to show to the taxi driver.